Last week I bemoaned the fact that I had fallen behind with my puzzling despite still being tempted to buy more and more toys by those pesky craftsmen. That trend continued this week when I received some new toys from Eric Fuller (including one from his auction site which I had been after for quite some time) - I will show them off on my New additions page soon. I've actually had a week of annual leave this week and have only had time to solve just one puzzle during the whole week! Mrs S has forced me to do lots of "maintenance stuff" around the house as well as do a very thorough (and exhausting) clean up of the garden. In fact I am quite surprised that I can move today after spending so many days lifting and bending outside in the blistering heat (it was 38ºC)! I was even able to get up and down to re-grout and reseal my shower this morning! Whenever I seem to be up against a blog-writing wall, my good friend and the official Puzzlemad foreign correspondent, Mike Desilets, springs into action to my rescue with something very different to my usual fare which is always beautifully written and interesting. He has done it again this week - thanks Mike. This installment picks up where the last one left off - in the realm of vintage sliding block puzzles. There is one more of that class that I feel compelled to highlight before taking you off in a completely unexpected direction. So let’s get right to business. Our fourth vintage slider comes from Amanda’s collection, as you probably guessed, but I intend to get copy for myself very soon. It is the Qwik-Sane puzzle, invented by James R. O’Neil and produced and sold by WFF’N PROOF (WFF = well-formed formula). 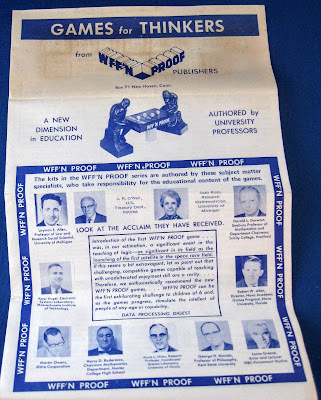 WFF’N PROOF enjoyed an early peak of popularity in the 1960s and 70s, which is why I put them in the vintage category, but they continue to produce their diverse range of logic-based puzzles and games today (under the care of the Accelerated Learning Foundation). This line has an explicitly intellectual bent. As the Qwik-Sane box informs us, this is “A Topological Puzzle for Thinkers.” The attitude and approach foreshadowed Binary Arts’ early philosophy (and marketing) and has a certain Gardneresque quality to it. WFF’N PROOF was also one of the early advocates of puzzles and logic games for “mental fitness.” Their signature logic game, WFF’N PROOF, claims to improve your IQ by 20 points after three weeks of play! Of course, the marketing of logic games and puzzles for mental fitness has been all the rage over the past few years. This despite the fact that there is no empirical evidence that they provide significant mental benefit. If you’re after mental improvement, then I suggest getting out of your puzzle chair and exercising. You’ll find this article very revealing. But marketing is marketing, and the idea of puzzling as mentally ‘healthful’ has an undeniably intuitive pull. The good people at Thinkfun® have been particularly adept, though certainly not alone, in capitalizing on this fact. Witness their repackaging of several established puzzles into a “Brain Fitness” line that encourages the buyer to “Cross Train Your Brain.” The science was perhaps somewhat equivocal when the line was launched (I’m being generous), but it has become increasingly less so with each new study. It will be interesting to see if profitability trumps intellectual honesty for puzzle manufacturers going forward. Recent legal decisions have slapped down the most egregiously deceptive ‘brain health’ claims (e.g. Lumosity). I can only assume this has industry-wide after-effects. Qwik-Sane, with custom outer cardboard ‘frame’ by vintage puzzle surgeon Amanda. Sorry, that was an unplanned digression. A blog goes where it will (Ed - I particularly enjoyed the meander off territory). I should mention that I have no intention of impinging the honour of one of puzzling’s most successful and profitable companies. I actually love Thinkfun’s products and I own a good many of them. Later in this post I will even review one of them (I think I just heard my editor fall out of his chair; this will be another Puzzlemad first, if I’m not mistaken (Ed - OUCH! That hurt!)). But let’s get back to the puzzle at hand, for goodness sake. As mentioned, Qwik-Sane came from the mind of James R. O’Neil. Not much is known about Mr. O’Neil. We do know that he held a number of patents for games, see here and here. And we also know that he invented Qwik-Sane sometime after his retirement from the U.S. Department of the Treasury, probably in the late 1950s or very early 1960s. Cool vintage literature. Old puzzles are like time-capsules. 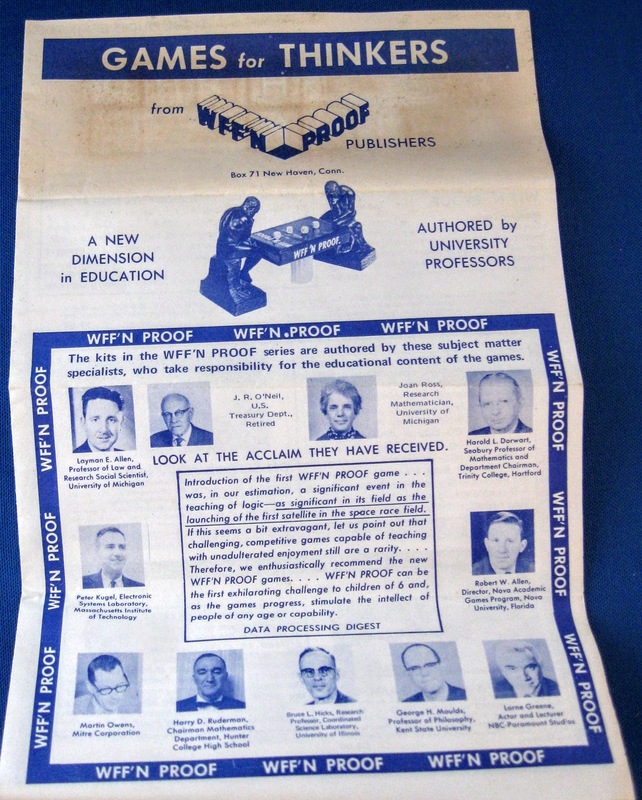 WFF’N PROOF offerings (including Qwik-Sane) from an ad in a 1978 issue of Popular Science. Although Qwik-Sane is in some respects a straightforward slider, it is also somewhat different from the vintage sliders I discussed earlier. The puzzle consists of 9 lettered, one-unit-square blocks (unique except for two Hs), 1 two-unit rectangular block, 1 three-unit rectangular block, 1 square block with an image of Auguste Rodin’s “The Thinker,” and finally 1 square place-holder block numbered “35.” The 35 block indicates the number of moves (ideally) it takes to solve the puzzle. The starting layout of the puzzle is as shown in the figure. After removing the “35” block, the objective is to transport the “thinker” from the upper right to the lower left (instructions are to remove “35,” put thinker in upper right, then maneuver it to lower left). Unlike many early sliders where the final position for most blocks is arbitrary and only a target block is moved to a required solved position, in Qwik-Sane all the blocks except the two H’s are uniquely marked and have required positions. Not only must your traveling block reach its destination, all the other blocks must be returned to their original positions. I don’t know the sliding block class well enough to know if this is was innovative in the 1960s, but it certainly enhances the solving process and puts the puzzle a cut above most of the other sliders I’ve played with. It bears a certain similarity to the Time puzzle, which I also enjoyed immensely. There is not just a pathway to the solution, but a system of movement to be discovered. Kevin, take note—this is your kind of slider. Think of it as a two-dimensional twisty if that helps. (Ed - You've convinced me! I have been looking out for a copy of the Time puzzle but not found one yet - I have managed to find something similar and modern which I will show off at the end of the post). With a 35-move shortest solution, Qwik-Sane provides plenty of challenge. I didn’t count my moves, but it couldn’t have been more than 50. That sounds like a lot, but they go by quickly. Fortunately, this layout does not send you down long dead end pathways like some of the more difficult sliders. My approach was to get the thinker to his required spot first, then reconstruct the lettering without disturbing him any more than necessary. There were some set-backs, but it was enjoyable working out the proper moves. This puzzle certainly has replay value. Wait a week and you will probably have to figure it out all over again, though the moves will likely get more ingrained the more you play. Since I have to give this copy of Qwik-Sane back to Amanda, there is no danger of that happening to me. Qwik-Sane is a great example of mid-century American puzzle design and it seems to have enjoyed a very wide and long-lived distribution. There is even a copy in the collections of the Smithsonian’s National Museum of American History. They provide a nice write-up, from which I have drawn liberally. 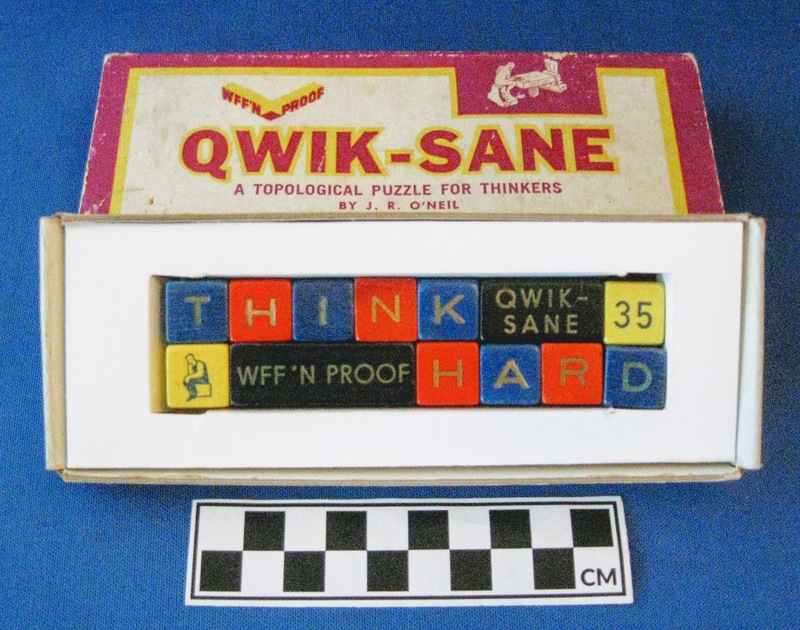 Vintage Qwik-Sane puzzles are widely available on ebay and other second-hand sites, usually very cheaply. 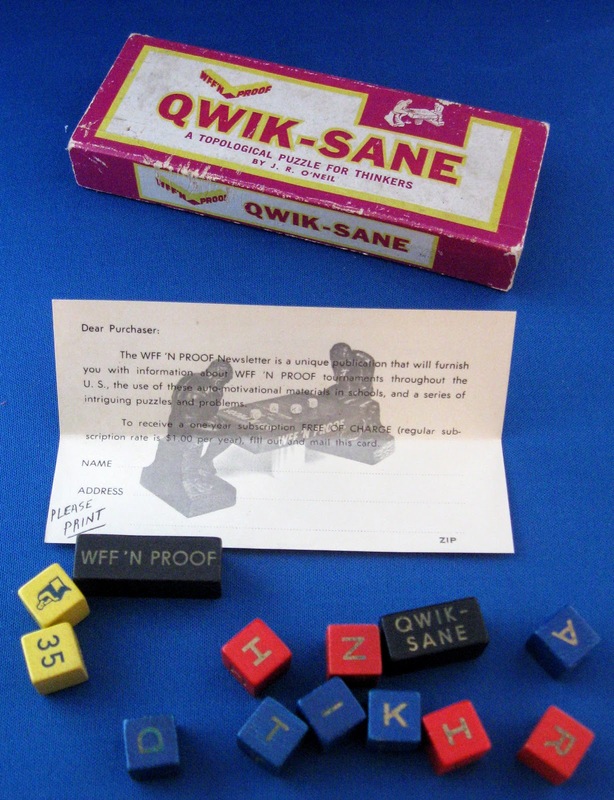 I was also shocked and pleased to find, as mentioned above, that Qwik-Sane is still being sold by the original makers. You should probably get your puzzle from the source, unless you prefer true vintage (a real collector would get both). Check out the offerings of the Accelerated Learning Foundation and also read about president, founder, and WFF’N PROOF inventor Layman Allen. It’s a small off-shoot chapter in puzzle history (they are more into games than puzzles, truth be told), but certainly worth knowing about. A long-lived puzzle that holds up well. Gabriel has, of course, already reviewed Solitaire Chess. So why retread old ground? 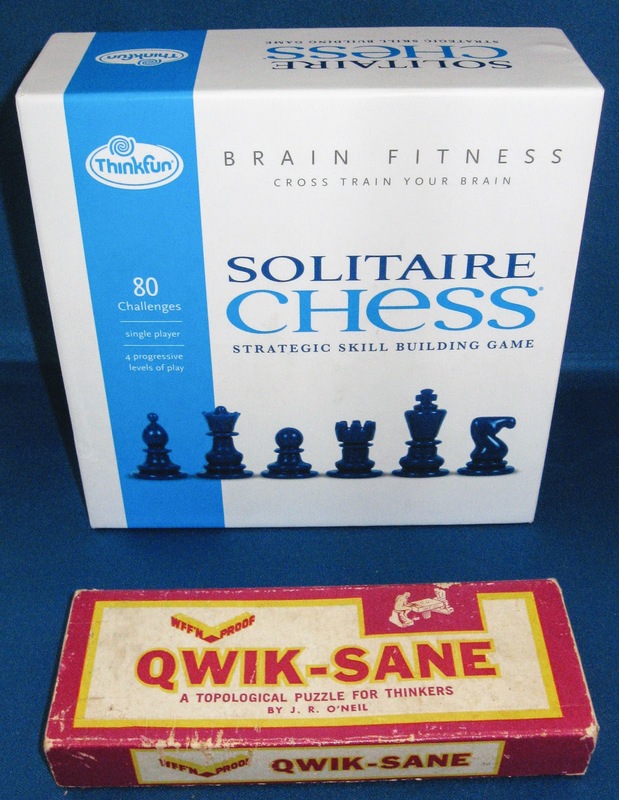 Well, Gabriel’s review dates to 2012, and while still perfectly serviceable in all respects, Thinkfun has since repackaged and reissued Solitaire Chess as part of their Brain Fitness line which I good-naturedly derided above. This review is meant as a kind of update to Gabriel’s review. Also, you can never have too many perspectives on a classic puzzle. Sure, it’s only been around since 2006, and history will be the final judge, but I have no hesitation dubbing it a “modern” classic. 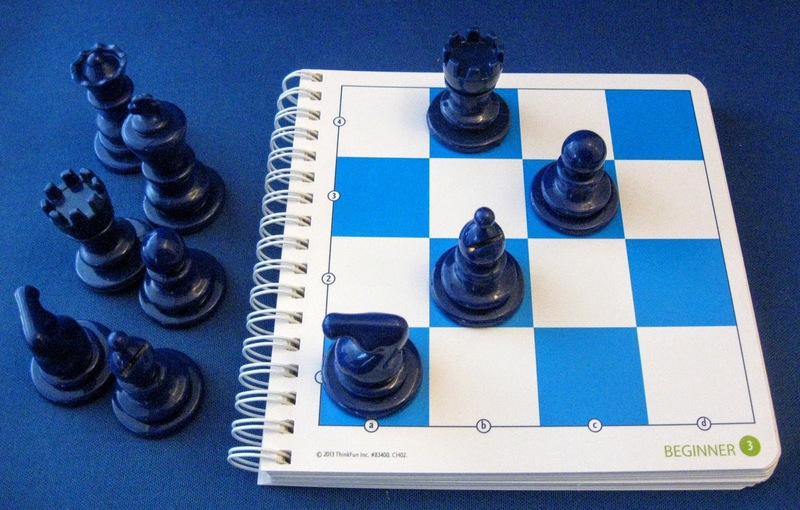 Vesa Timonen’s Solitaire Chess; Brain Fitness version by Thinkfun. 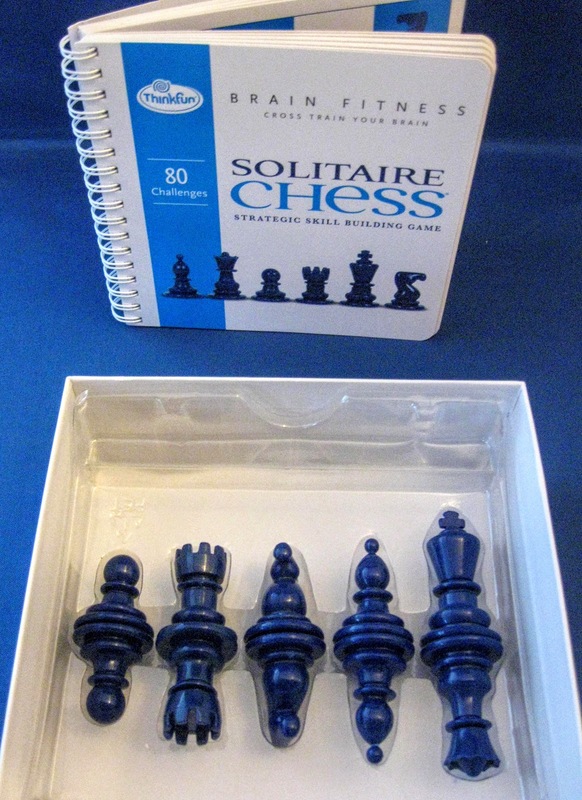 I’m going to assume you’ve read Gabriel’s review before embarking on this one, so you already know that Solitaire Chess is the invention of Vesa Timonen. No need to go into Vesa’s credentials, we all know them well enough. I will just say, for the record, that he is one of my favorite designers. For his puzzles, of course, but also for his design philosophy. You can find a great interview with Vesa over here which provides some insight into his process and approach. You’ll learn that not only did he invent solitaire chess conceptually, he had to develop the software that generates the many individual puzzle challenges. The whole process took about a year and half. Time well spent I’d say. Even out here in Hawaii I know of three stores within easy driving distance where I can pick up Solitaire Chess. A great design combined with Thinkfun’s extraordinary distribution network, it has become a fantastically successful puzzle, arguably in the league of Nob Yoshigahara’s Rush hour, if I may be so bold. It’s no spoiler to note that the knight, with its unique L movement, does the lion’s share of work at the higher levels. The knight’s interaction with the other pieces allow this puzzle to achieve some very challenging configurations. The rooks and bishop’s certainly traverse the board in interesting ways and are not to be underestimated. Perhaps the biggest surprise was the central role of the humble pawn in several of the higher-level layouts, often far in excess of its station. Although the pawn has very limited movement, it has the ability to linger outside of the main action and is consequently difficult to ‘get to.’ You’ll understand when you play. Another surprise was the role that the king and queen play in this puzzle. They figure prominently in the earlier challenges but become increasingly rare at the higher levels. I think this is due to their high latitude of movement. The queen can usually muscle her way through any layout and sweep the board. The king less so, but ultimately its rôle in a solution was simpler for me to intuit. 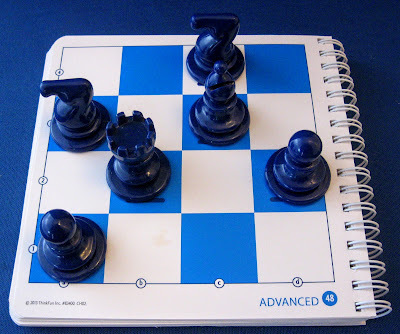 Importantly, the king must be the final piece on the board whenever it is present in a layout. Something a little more challenging. Part of the excuse for this review was the reissuance of the puzzle in the years following Gabriel’s initial treatment. At present, you can purchase either the original version or the new Brain Fitness version. I have the latter. You can also download a mobile Solitaire Chess app (iOS UK, iOS US, Android) from Thinkfun for $2.99 for play anywhere, anywhen. There seem to have been other apps around, but my quick and dirty google search produced mostly dead links. Although my preference is always for a physical puzzle, it is worth noting that Thinkfun provide 400 electronic challenges for your $2.99 purchase. Buying the physical puzzle will run you $20 US and you get either 60 (original) or 80 (Braintrain) challenges. The superior value of the electronic version is clear. Better yet, just go to the Thinkfun website and play for free! I don’t know how many challenges they provide, but it’s a good option if you are sitting on the fence. But back to the physical puzzles. 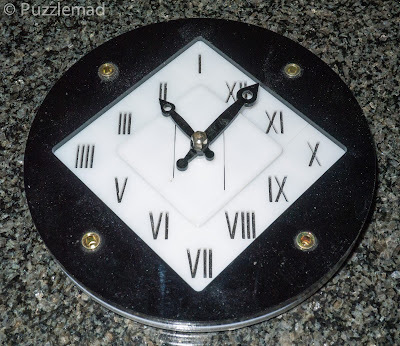 This is a mechanical puzzle blog, after all, and I can only push my editor’s patience so much per post (Ed - you've been so good to me that you have a LOT of leeway). Depending on the store you go to, you will see either the original version (as reviewed by Gabriel) or the new Brain Fitness version. The original follows Thinkfun’s early approach (now fading) of providing an entirely self-contained puzzle. The puzzle itself doubles as a box that contains all the pieces and the challenge cards. This is handy and I normally favor this approach. It’s neat and tidy. That said, I must admit that I prefer the Brain Fitness version, which comes in a slick cardboard box that is clearly labeled for an adult audience. No exuberant cartoon characters or exclamation points on this one. The game is played directly on the challenge cards, which are strung on a smoothly turning spiral binder. There are two reasons I like this construction. First, setup is faster. If you’ve played any of these modern multi-challenge puzzles at all, you’ll know that the set-up phase can quickly become a tedious chore. In the original version, you have to slide a card under the transparent play surface and then set up the pieces. Then remove it and begin again, etc. I know it doesn’t sound terrible, but by layout 40 you’ll wish there was a better way. I think the Brain Fitness version is more efficient in this respect - just flip the card and throw down the pieces. The second reason I like it has to do with piece movement, or lack thereof. The plastic play surface of the original has circular indents that hold the chess pieces in position, but also prevent sliding them around. This goes against the grain for anyone who has actually played chess. I prefer my pieces to slide across the board. The hard glossy cardstock challenge cards in the Brain Fitness version provide a great surface. Overall, I prefer the newer version for its ease of play and manipulation. It also has 20 more challenges than the original, so there is that too. Price-wise, they are about the same. Now that all sounds like a good plug for Thinkfun, and surely they deserve your puzzle dollar, but you actually do not need to pay anything to take a stab at this puzzle. Everyone has access to a chess set (at least in this audience) (Ed - I am ashamed to admit that I don't own a chess set because I am so bad at it and Mrs S doesn't play either) and everyone can make a 4 x 4 grid with paper and pencil. All you are missing, and what Vesa has worked so hard to generate, are the challenges. Luckily for us, Thinkfun at one point offered a set of 40 free solitaire chess challenges. I don’t know when or where this happened, but the internet is forever and the pdf pops up in a number of places around the web. I imagine Thinkfun would prefer to sell puzzles, not give them away. But knowing that the leadership at Thinkfun have a strong relationship with the avocational puzzle community, I believe they won’t begrudge us a little fun at their expense. They are rich beyond all imagination, I assure you. That said, I recommend you click here for the extra challenges before the lawyers, Interpol, and/or Mr Timonen break down Kevin’s door and haul him away (Ed - too late!!! The men in white coats have got me). For those of you like me who are happy to purchase a copy of Thinkfun’s very well-made puzzle, these extra challenges simply provide additional value and fun. With the sole exception of challenge 9F, which is equivalent to Brain Fitness challenge #26, they are all new challenges (I went to the trouble of checking them all for you. Just one of the many services we here at Puzzlemad provide.). They probably come from the 400 challenges in the electronic game, I imagine. I don’t think they come from the original version, but maybe Gabriel or someone can check on that and let us know. That’s it for this post. Thanks for tuning in and congratulations on making it all the way to the end. Hopefully it was worthwhile and, like all Puzzlemad posts, will help separate you from your money. Happy puzzling! Thank you so so much Mike. That was a very enjoyable read and may even stimulate me to buy the puzzles, or a chess set or.....having surfed the web for nice chess sets I am very tempted to buy a beautiful Backgammon set - I am a not bad player but only have a small travel set not something of beauty for the living room! Hopefully when I am back at work I will get some time to solve some of my backlog of new puzzles!